A table of simple and elegant design, also suited for cramped environments, where it can be extended at will in a few seconds using the 80 cm supplied extension. By turning a frame knob, the extension appears almost magically while the main table top remains horizontal, hence usable, during the extension process. 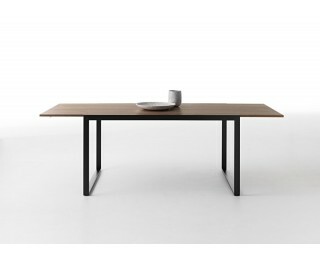 Table with frame and trestle made from powder-coated electro-welded rectangular steel tubes. Galvanized threaded bar joining the restle to the frame. Top with honeycombed wood surface and extension made from particleboard, veneered or laminated at high pressure, 20 mm thick. Coated aluminium hinge connecting the top and extension. Chains for fastening the table fully open. Closing lever with PVC knob. PVC feet. The collection’s common denominator is exclusivity, expressed through refined technologies or invisible mechanisms and always distinguished by precise craftsmanship and attention to detail. With its wide range of over 70 products, which come in a variety of sizes and finishes, Horm is able to create complete living environments that range from the dining room to the study and from the bedroom to the living room. Above all, however, with its range of furniture, which bring together simplicity, art and innovation, Horm offers a home environment that is essential, as well as refined, lending every home an air of uniqueness and exclusivity. In Old Aramaic, the word “horm” means “sacred enclosure with the right to asylum”. This enclosure, metaphorically speaking, has been constructed and looked after in Northeast Italy, a few kilometres from the city of Pordenone. It receives great masters of contemporary architecture, artists of international fame and versatile designers who, thanks to the experience handed down from generation to generation and the passion for wood of the local craftsmen, contribute to the development of products of great character that combine aesthetics, functionality and awe. Among the architects and designers collaborating with the company are: Mario Bellini, Mario Botta, Steven Holl, Toyo Ito, Matteo Thun, Karim Rashid, Todd Bracher, Sebastian Errazuriz, Ilaria Marelli, Salvatore Indriolo, Meneghello Paolelli Associati. The company was created in 1989 and has since gained an enviable series of important international awards, including three Compasso d’Oro awards (1998, 2004, and 2008), and two Chicago Athenaeum Good Design Award (2013, 2014). The company has also built a solid global network of resellers, exporting its products to over 70 countries in 2014.